Ousmane Dembele is a better player than Neymar, according to Barcelona president Josep Maria Bartomeu. Neymar became the most expensive player in the world in August 2017 when he left Barca for Paris Saint-Germain after the Ligue 1 side triggered his €222million release clause. Barca invested the sum in the likes of Dembele, who arrived from Borussia Dortmund for an initial €105m, although his time at Camp Nou has been disrupted by injury and disciplinary issues. 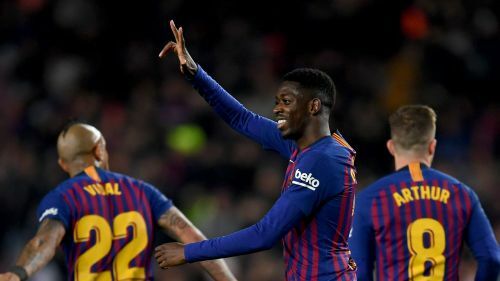 But Dembele has made 23 LaLiga appearances so far this season, scoring eight goals to help Ernesto Valverde's side establish a seven-point lead over Atletico Madrid in the title race. And although Barca have regularly been linked with pushing for Neymar to return, Bartomeu signalled he is happy with Dembele as the Brazilian's replacement. "I won't say yes or no," Bartomeu told Cadena SER when asked if Barca could buy Neymar back. "I say that with their [PSG's] money, Barca made a sporting bet. "With that money we went for players like Dembele and [Philippe] Coutinho. "Dembele is better than Neymar. He's at Barca and he is better." Barca have already sealed a deal worth a total €86m for Ajax midfielder Frenkie de Jong, who helped dump Real Madrid out of the Champions League on Tuesday. Matthijs de Ligt has been linked with following his fellow Netherlands international to Camp Nou and Bartomeu appeared to confirm the Ajax captain is a transfer target. "We have to talk about it from March," he added of the Golden Boy winner. "Which is when we take the decisions, but his name is on the table, of course." Are we witnessing the fall of the La Masia?